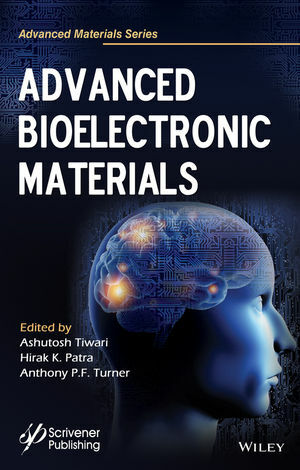 Advanced Bioelectronic Materials contributions from distinguished international scholars whose backgrounds mirror the multidisciplinary readership ranging from the biomedical sciences, biosensors and engineering communities with diverse backgrounds, interests and proficiency in academia and industry. The readers will benefit from the widespread coverage of the current literature, state-of-the-art overview of all facets of advanced bioelectronics materials ranging from real time monitoring, in situ diagnostics, in vivo imaging, image-guided therapeutics, biosensors, and translational biomedical devices and personalized monitoring. Ashutosh Tiwari is Chairman and Managing Director of Tekidag AB; Group Leader, Advanced Materials and Biodevices at the world premier Biosensors and Bioelectronics Centre at IFM, Linköping University; Editor-in-Chief, Advanced Materials Letters and Advanced Materials Reviews; Secretary General, International Association of Advanced Materials; a materials chemist and docent in the Applied Physics with the specialization of Biosensors and Bioelectronics from Linköping University, Sweden. He has more than 400 publications in the field of materials science and nanotechnology with h-index of 30 and has edited/authored over 25 books on advanced materials and technology. He is a founding member of the Advanced Materials World Congress and the Indian Materials Congress. Hirak K Patra completed his PhD in 2007 on "Synthetic Nanoforms as Designer and Explorer for Cellular Events" at the University of Calcutta, well known for its fundamental education system with three Nobel Laureates in Asia. He moved to the Applied Physics Division of Linköping University with the prestigious Integrative Regenerative Medicine fellowship at Sweden to work with the Prof. Anthony Turner at his Biosensors and Bioelectronics Center. He has published 17 articles in top journals, 4 patents, and has been honored with several "Young Scientist" awards globally.